Rimini is famous for its hospitality. 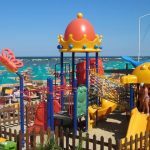 Geographically it extends along the Adriatic Sea (Romagna Coast) with 15 km of fine, golden sandy beaches. A flat land, surrounded by hills scattered with castles, manor-houses and ancient residences. 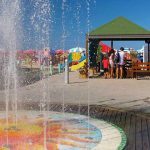 The territory offers over 227 bathing establishments, more than 1000 hotels, numerous amusement and theme parks for the delight of children and adults, such as: Italy in Miniature, Aquafan (water games and pools), Oltremare (aquarium), Fiabilandia and more than 30 discos. Rimini is located in an area with an extremely high tourist presence and offers a wide selection of accommodations: luxury and 4-star hotels complete with wellness centers and saunas, the classic 3-star accommodation with swimming pool and air conditioning, the typical family-run pension and bed and breakfast facilities. The wide variety offered in Hotel and Residence Rimini will certainly respond to every visitor’s needs. Rimini has developed its reputation for “hospitality” in an area rich with natural beauty and art treasures; in fact, Rimini is not just a beach resort. Rimini is the ancient “Ariminum” which conserves many “treasures” from the Roman period as well as the Renaissance. The “Arc of Augustus”, “Tiberius Bridge”, the “Residence of the Surgeon”, the Castle of Sigismondo Malatesta, the Malatesta Temple as well as the Rimini Museum. Here three important Roman consular roads intersect: the Via Flaminia, which passes through the spectacular gorge at Furlo, arrives in Rome; the Via Emilia arrives in Bologna, and the Via Popilia (which becomes Via Romea) arrives in Ravenna and continues on to Venice. 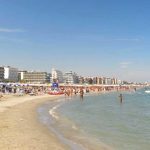 Rimini and the whole region is famous for gastronomy. You cannot miss tasting the piada (the original, hand-made one, not the packaged version). This simple scented round disk prepared only with flour, water, a little bit of extra virgin olive oil and a pinch of salt is great together with salame and local cheese like squacquerone, vegetables “au gratin”, sausages and much more because piadina is suitable for anything. Rimini is a seaside resort, thus seafood is the culinary protagonist: tasty platters of grilled sardines, mackerel, squid, a variety of shellfish, monkfish and sole, all scented with a touch of ground parsley, garlic, breadcrumbs and olive oil; or the local dish of clam sauce on hand-made noodles. For “land-lovers” a typical meat menu could start with “strozzapreti” (local pasta speciality) or hand-made “tagliatelle”. Before leaving the city, don’t miss walking through the open-air market held in the center every Monday and Wednesday morning, visit the handicraft shops, the stylish boutiques, those selling typical rust-printed linens, ceramics, earthenware pans from Montetiffi for cooking piada. Taste the Saba (thick wine must) – ideal for your special recipes. Lastly, don’t forget the “formaggio di fossa” the cheese seasoned in the tufa pits of Sogliano and Talamello. 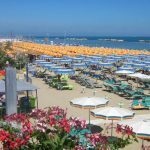 Remember – it’s impossible not be be infatuated by Rimini: a locality which offers strong emotions both for the heart and mind.